View From Geneva Has Moved to a New Website! GENEVA, October 1, 2015 – Saudi Arabia has managed to block a Dutch-led draft resolution at the UN Human Rights Council that would have dispatched the UN rights office to investigate possible war crimes by the Saudis, Iran-backed Houthis and others, in the conflict in Yemen. For more on the U.S. position, informed by its direct support for the Saudi-led bombing attacks in Yemen, see this AP report. The UN falsely claims that nothing could have been done to stop the world’s most misogynistic regime from being allowed to head a UN human rights committee that selects experts. In 2003, that’s the same line they tried to push in defense of electing Qaddafi’s Libyan regime — except the American government showed then that in fact it could challenge the system and call a vote. Sadly, Europe refused to join the US (only Canada and Guatemala did), and the rest is history. The Commission on Human Rights — meeting this morning under a new procedure two months in advance of its annual six-week session — elected Najat Al-Hajjaji of the Libyan Arab Jamahiriya as Chairperson for 2003, along with three Vice-Chairpersons and a Rapporteur. Ms. Al-Hajjaji was elected by a secret ballot of 33 in favour and 3 opposed, with 17 abstaining among the Commission’s 53 member countries. The vote, requested by the United States, was unusual — Chairpersons are usually elected by acclamation. Q – What is the UN Human Rights Council’s Consultative Group (CG)? 47. A consultative group would be established to propose to the President, at least one month before the beginning of the session in which the Council would consider the selection of mandate‑holders, a list of candidates who possess the highest qualifications for the mandates in question and meet the general criteria and particular requirements. 48. The consultative group shall also give due consideration to the exclusion of nominated candidates from the public list of eligible candidates brought to its attention. 49. At the beginning of the annual cycle of the Council, Regional Groups would be invited to appoint a member of the consultative group, who would serve in his/her personal capacity. The Group will be assisted by the Office of the High Commissioner for Human Rights. 50. The consultative group will consider candidates included in the public list; however, under exceptional circumstances and if a particular post justifies it, the Group may consider additional nominations with equal or more suitable qualifications for the post. Recommendations to the President shall be public and substantiated. 51. The consultative group should take into account, as appropriate, the views of stakeholders, including the current or outgoing mandate-holders, in determining the necessary expertise, experience, skills, and other relevant requirements for each mandate. 52. On the basis of the recommendations of the consultative group and following broad consultations, in particular through the regional coordinators, the President of the Council will identify an appropriate candidate for each vacancy. The President will present to member States and observers a list of candidates to be proposed at least two weeks prior to the beginning of the session in which the Council will consider the appointments. 53. If necessary, the President will conduct further consultations to ensure the endorsement of the proposed candidates. The appointment of the special procedures mandate-holders will be completed upon the subsequent approval of the Council. Mandate-holders shall be appointed before the end of the session. Officially, then, the ambassadors who are members of the influential CG serve in their “personal capacity.” In practice, however, for many members it is known that this is hardly the case. Members are in frequent contact with, and generally reflect the views of, their respective regional groups — and in certain documented cases they even abuse their positions on the CG to subvert the integrity of the selection process and advance their own government’s preferred candidates. Q – How did the Saudi Ambassador get to the CG in the first place? A – The root cause of the scandal came in in November 2013, when the UN’s elected Saudi Arabia to be one of the 47 members of the Human Rights Council, by an overwhelming majority of 140 votes — meaning, more than two-thirds of the General Assemby supported the misgonystic theocracy. This gave Saudi Arabia key influence at the UNHRC, and elevated its Geneva profile. Exactly one year later, in November 2014, Kazakhstan — another dictatorship that sits on the UNHRC — sent a letter to the UNHRC president announcing that the Asian-Pacific Group on Human Rights had “nominated” the Saudi ambassador for membership on the CG for 2015. Less than three months later, in February 2015, the Saudi ambassador was declared to be the Vice-Chairperson of the CG. Q – How is the Chairperson of the Consultative Group (CG) selected? A – The UN has never revealed the process of how the CG chooses its head (last year it was called “Chair,” and now it is “Chairperson”), though presumably it is done by the five members of the CG, acting by consensus vote. Interestingly, the UN human rights office this week, under pressure from world outrage over the Saudi chairmanship, insisted — in a grossly misleading and self-serving statement signed by no person or entity — that countries like Saudi Arabia merely “assumed the chair” on a “rotating basis.” The UN’s attempt to use passive language and render the act automatic was quite deliberate. There was no explanation why the Chilean ambassador did not sit out the full 2015 term. If there is a rotation, why does the CG need to “designate” anyone? Why does the Chilean get announced as the 2015 Chair, then serve only one selection cycle, while the Saudi sits for two? Saudi Arabia has sponsored its own softball UNHRC resolution on the Yemen conflict in order to supplant a Dutch-led draft resolution that would dispatch the UN rights office to investigate possible war crimes by the Saudis, Iran-backed Houthis and others. 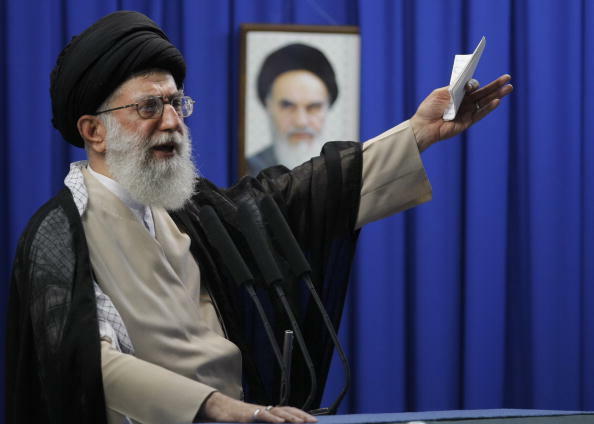 Published on September 25, 2015 in Consultative Group and Iran by unwatch. Closed Tags: Idriss Jazairy, Unilateral Coercive Measures. Jazairy has already accused the U.S. and Europe of being leading human rights violators due to their use of sanctions against countries like Iran and Zimbabwe. Indeed, many of the resolutions adopted at each session of the UNHRC are sponsored by Cuba, Iran, Pakistan, Algeria, and other non-democracies, and are designed to demonize the West, free market economies, individual rights, or Israel, as part of a strategy to deflect attention from council members who are guilty of subjugating women, trampling religious freedom, persecuting gays, oppressing ethnic minorities and promoting relgious extremism. Saudi Arabia pledged $1 million to the UN human rights office before it won a seat on the UN Human Rights Council in November 2013, paving the way for its chairmanship — just announced by the UN last week on September 17th — of the influential UNHRC committee that interiews and shortlists candidates to become UN human rights investigators. 42. 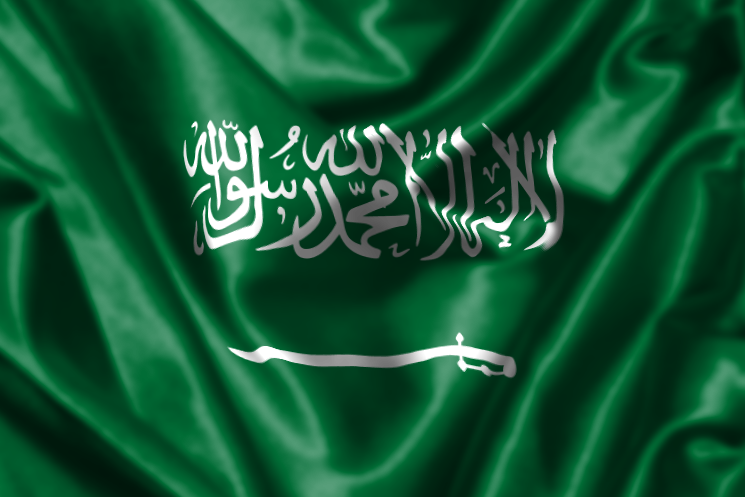 Should Saudi Arabia be selected as a member for the period 2014-2016, it pledges to continue to support tirelessly the work of the Human Rights Council. It will continue to adhere to Human Rights Council resolutions, cooperate with its mechanisms and actively participate in its work during its regular and special sessions and in the session of the Social Forum. • Cooperate with the Office of the High Commissioner for Human Rights and the specialized agencies of the United Nations with regard to meeting the country’s training needs in the protection of human rights, building national capacity and identifying additional ways of protecting and promoting human rights. As chair of the UNHRC Consultative Group, the Saudi government has access to unique information and influence. Certain members of the powerful consultative group have in the past used their positions to unfairly privilege their preferred candidates. Most famously, Morocco’s ambassador in 2014, according to a leaked cable, faxed to his ministry a confidential document outlining the entire interview procedure and questions that Houria Es-Slami, a candidate from Morocco, would be asked. Coincidentally, we are certain, Ms. Es-Slami then succeeded in obtaining the consultative group’s top ranking, and now sits on the UN working group on disappearances. Amnesty International later filed a complaint after the episode was leaked, and the president acknowledged the integrity challenge. Director-General of the United Nations Office at Geneva. GENEVA, September 20, 2015 – U.S. Ambassador Samantha Power and EU foreign minister Federica Mogherini should condemn and work to reverse the appointment of Saudi Arabia as head of a key UN Human Rights Council panel that selects top officials who shape international human rights standards and report on violations worldwide, said UN Watch, a non-governmental watchdog organization based in Geneva. which today us hosting an UNRWA official at its Geneva panel. He deleted it after exposed by UN Watch. GENEVA, September 17, 2015 – UN Watch urged UNRWA, the relief agency for Palestinians, not to legitimize a Hamas front group known as the “Palestinian Return Center” (PRC) and to stop its Brussels-based representative Elena Mancusi-Materi from addressing a panel event organized today at the UN Human Rights Council in Geneva. “By legitimizing a known Hamas front group, this incident only underscores the serious questions raised recently about UNRWA’s neutrality in light of its failure to discipline at least a dozen UNRWA officials who, as documented in our report, are spreading racial hatred and inciting to terrorism on the Internet,” said Hillel Neuer, executive director of the non-governmental Geneva-based monitoring group UN Watch. Hamas leader Ismail Haniyeh recently congratulated the PRC for managing to win UN status as a NGO, despite all the leading democracies on ECOSOC voting against them, including the U.S., UK, France, Germany, Australia, Italy and Austria. The PRC and its leadership have extensive, documented ties with Hamas, which is designated as a terrorist organization by the European Union, Canada, Israel, Japan, and the United States, and, its armed wing is designated a terrorist organization by Australia and the United Kingdom. PRC leaders also celebrated the Hamas kidnapping of three Israeli teens, cheered Hamas rocket attacks on Israeli civilians, and threatened “punishment” for PLO President and Hamas rival Mahmoud Abbas. Just two years ago, Egypt killed 1,000 people in one day. Now they seek a seat on the UN Security Council. Of course, they will get it. The vote at the UNGA is next month. The draft resolution (HTML version) was submitted today to the four influential UNHRC member states by the Geneva-based non-governmental organization UN Watch, which recently invited Mr. Lopez’s wife, Lilian Tintori, to address the council. 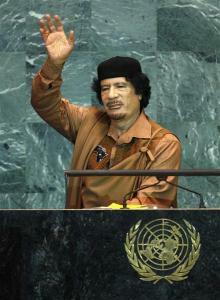 The text calls for the dispatch of an independent commission of inquiry to Venezuela, and for the suspension of Venezuela from the council, which has a precedent in the UNHRC’s 2011 ousting of Libya’s Gaddafi regime from its membership. “Venezuela’s verdict, following a trial that denied basic due process to the defendant, is a travesty of justice that exemplifies the Maduro government’s gross and systematic violation of its own citizen’s basic rights and freedoms,” said Hillel Neuer, executive director of UN Watch. “When the jailer of a human rights hero is allowed to sit as a world judge of human rights, it’s like having a pyromaniac as the town fire chief. 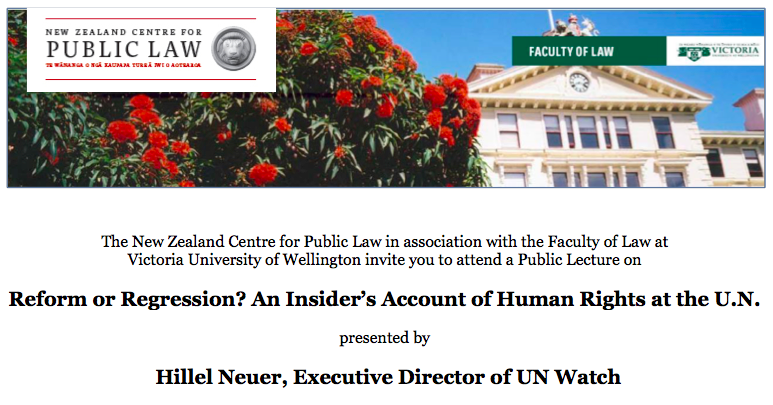 It’s absurd, and casts a shadow upon the reputation of the United Nation as a whole,” said Neuer. The U.S., France, Germany or the UK will now have time to consider and, if they choose, to revise the text, hold informal consultation with fellow member states and observer states, and then submit it formally to the council by September 28th. Voting on resolutions begin on Oct. 1. A decision of the Council to suspend Venezuela would then need to be ratified by the UN General Assembly in New York, which is likely to ensue once the action enjoys sufficient support from the Geneva-based Council. UN Watch was founded in 1993 by the late civil rights leader Morris Abram, and has been a leading voice for human rights in Venezuela, providing a global platform to relatives of Mr. Lopez, to former political prisoners, dissidents, human rights advocates, student leaders, and democracy protest organizers. UN Watch organizes the annual Geneva Summit for Human Rights and Democracy with 20 other NGOs. GENEVA, Sept. 11, 2015 – The following proposed resolution to suspend Venezuela from the United Nations Human Rights Council, was submitted today by UN Watch to the following member states for them to table it at the UNHRC session opening on 14 September 2015: the United States, France, Germany, and the UK. Faced with compelling evidence of UNRWA personnel inciting to anti-Semitism and violence, spokesman Chris Gunness has responded with a campaign of attacks against UN Watch, reminiscent of the smear campaigns of U.S. Senator Joseph McCarthy. 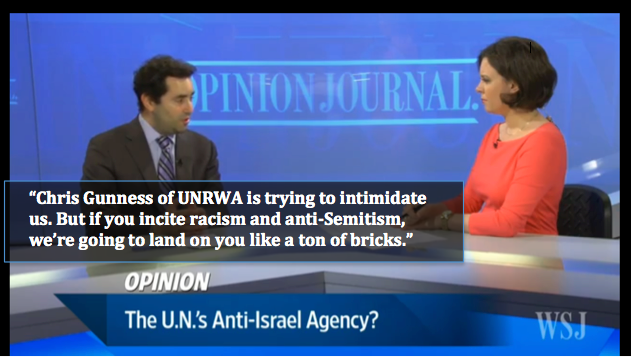 UNWRA spokesperson Chris Gunness promised to fire UNRWA officials who promote antisemitic violence, a pledge that will be put to the test this week as UN Watch submits detailed evidence of such incitement to the United Nations. Gunness’ comments were made in response to information documented two weeks ago by the blogger Elder of Ziyon. If there are allegations, and if this is true, it is indeed a very big problem, and we will deal with it. Where we find credible allegations of neutrality violations among our staff, we investigate and where it’s appropriate we take disciplinary action, up to and including dismissal. And that process is audited by our major donors, with the United States and the European Union who are the biggest suporters of Israel on the international stage. GENEVA, September 1, 2015 – UN Watch released a new report today documenting 12 different Facebook accounts operated by UNRWA officials (see images below) that openly incite to antisemitism and terrorism, and urged UN Secretary-General Ban Ki-moon and UNRWA chief Pierre Krähenbühl to terminate the responsible officials, condemn the offending posts, and establish a commission of inquiry, comprised of representatives of top donor states (see chart at right), to investigate the culture of impunity for perpetrators of racism and incitement that pervades UNRWA. “The pattern and practice of UNRWA school principals, teachers and staff members posting antisemitic and terror-inciting images suggests a pathology of racism and violence within UNRWA that must be rooted out, not buried, as UNRWA spokesman Chris Gunness has attempted to do by calling for boycotts of newspapers or NGOs that report these incidents of hate,” said Hillel Neuer, executive director of UN Watch, a non-governmental Geneva watchdog organization. “The UN must recognize that these disgusting posts, published on Facebook accounts run by people who identify themselves as UNRWA officials, constitute a gross violation of the International Covenant on Civil and Political Rights, which prohibits “incitement to discrimination, hostility or violence,” said Neuer. 1. A hmed Fathi Bader, identifying himself as a Deputy School Principal at UNRWA (screenshot), posted the photo above (screenshot) and praised the murder of “a group of collaborators with the Jews,” an incident strongly condemned by Amnesty International and other human rights groups, saying how much it “pleased” him. “Shame them in this world, and a painful punishment in the afterlife.” His UNRWA affiliation is further documented here (and captured here). Recommendation: UNRWA should fire Ahmed Fathi Bader for using the name of UNRWA on an account that promotes violence and terrorism. 2. Mohammed Abu Staita, who identifies himself on Facebook as working for UNRWA (captured here), posted the cartoon above (screenshot) on November 8, 2014, depicting a hook-nosed, black-clad, ultra-Orthodox Jew, with long Chasidic earlocks and a black hat stamped with a Star of David, cowering behind a tree, as the tree alerts an excited, gun-wielding Palestinian to the Jew’s presence. Recommendation: UNRWA should fire Mohammed Abu Staita for using the name of UNRWA on an account that promotes violence and terrorism. 3. Ramy Alshorbasy, who identifies himself as a teacher at UNRWA (captured here), last month posted the above anti-Semitic photo (screenshot), in which a cabal of cackling ultra-Orthodox Jews, crudely stereotyped with claws and earlocks, laugh at the fate of Palestinian babies. Recommendation: UNRWA should fire Ramy Alshorbasy for using the name of UNRWA on an account that promotes violent anti-Semitism and terrorism. 4. Abed Abuashraf, on the same Facebook account where he identifies himself as an UNRWA official (screenshot), advocates peeling Israel off the world map, to be violently replaced by a Palestinian state, in the two images (captured here and here) that he posted below, on July 10 and 13, 2014. Recommendation: UNRWA should fire Abed Abuashraf for using the name of UNRWA on an account that promotes violence and terrorism. 5. 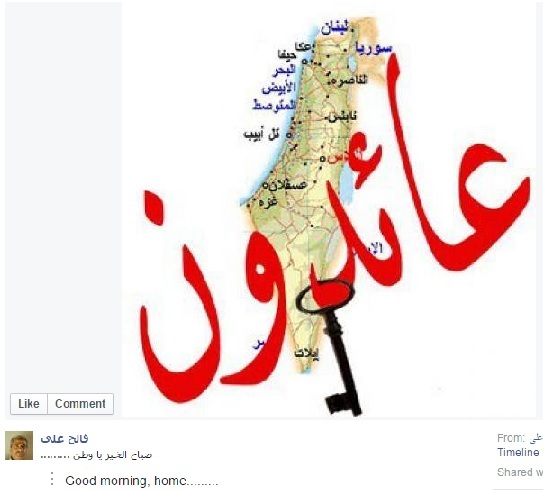 Wael Sallouh, who identifies himself as working for UNRWA on his Facebook page (screenshot), posted the photo below (also here) on June 16, 2014, to celebrate the kidnapping, four days’ prior, of three Israeli teenagers by Hamas terrorists. The cartoon shows a Palestinian prisoner taunting a frightened and sniveling Israeli guard by holding up three fingers, the symbol used last year by Palestinians to celebrate the abduction of the Israeli boys, who were later found murdered. Recommendation: UNRWA should fire Wael Sallouh for using the name of UNRWA on an account that promotes violence and terrorism. 6. Mohammed A. Elhafi, who identifies himself on Facebook (screenshot) as an employee at UNRWA, posted this photo (below and here) condoning violence, on December 31 2011, in which the word “Fatah” is written so as to incorporate a rifle. The Arabic caption underneath includes an exhortation to violence: “long live revolution”. Recommendation: UNRWA should fire Mohammed A. Elhafi for using the name of UNRWA on an account that promotes violence and breaches neutrality. 7. 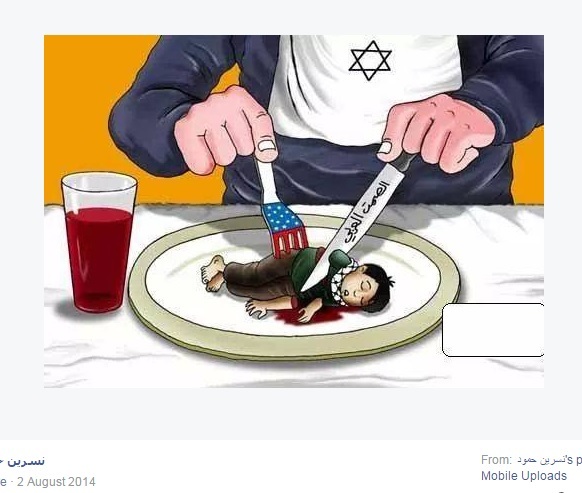 Nasreen Hammoud, who on her Facebook page (screenshot) says that she works for UNRWA, uploaded this cartoon (captured here and below), to Facebook on August 2, 2014. Israel, characterized by a man wearing a bib emblazoned with a Star of David, is seen feasting on a helpless Palestinian child with the aid of a U.S. Star-Spangled fork, and drinking his blood. Concern about this post has already been documented elsewhere, yet it remains active. Recommendation: UNRWA should fire Nasreen Hammoud for using the name of UNRWA on an account that promotes anti-Semitism and breaches neutrality. Recommendation: UNRWA should fire Fala Sala for using the name of UNRWA on an account that breaches neutrality. 9. 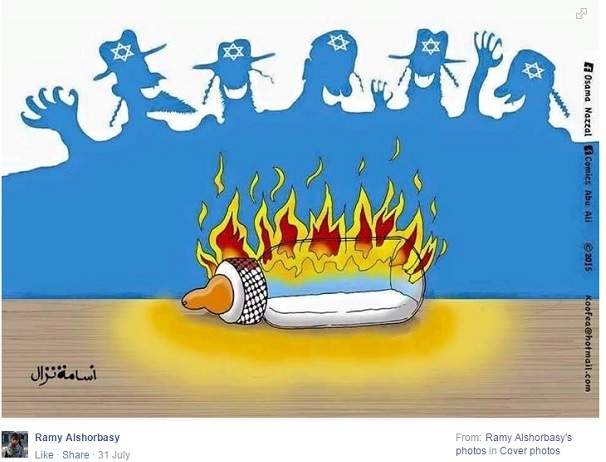 Mohamad Essa, who identifies himself as an UNRWA employee on his Facebook page (screenshot), posted the cartoon below (also captured here) on November 18, 2014, glorifying a gruesome terrorist attack on a Jerusalem synagogue of the same day. Two Palestinian men entered the crowded synagogue of Kehilat Bnei Torah, killing four worshipers at the scene while a further victim, a Druze Israeli police officer, died of his wounds in hospital. Recommendation: UNRWA should fire Mohamed Essa for using the name of UNRWA on an account that promotes violence and anti-Semitism. 10. Yousef Matar, a Human Resources Assistant at UNRWA according to his Facebook (screenshot), posted a photo (below and also here) on July 10, 2014, expressing support for an attack in which a rocket was launched towards Israel from Gaza. In another post, he uploaded a picture (screenshot) condoning violence, reminding Palestinians of their “duty” of “resistance”. Recommendation: UNRWA should fire Yousef Matar for using the name of UNRWA on an account that promotes violence and terrorism. 11. Ahmed Dahdouh identifies himself on his Facebook page as an employee of UNRWA (screenshot). On April 24, 2012, he uploaded an image of a hooded figure hurling a rock (captured here), as shown below. The caption makes numerous mention of “revolution”. Recommendation: UNRWA should fire Ahmed Dahdouh for using the name of UNRWA on an account that promotes violence and breaches neutrality. 12. In the image below, the Facebook page of UNRWA Staff in Syria portrays Jews or Israelis as baby-killers, with a black figure marked by a Star of David shooting a baby in Gaza, under the headline “Stop Killing Babies.” UN Watch has captured the image here. Though Chris Gunness’ strategy is to claim all such pages to be “impostors,” UNRWA has given tacit if not official approval: the page was founded in 2013, and is well-known with a following of 16,000 people; it lists the official UNRWA website of unrwa.org as its website; and an official UNRWA email address (s.mohyaldeen@unrwa.org, belonging to UNRWA official Samer Mohy Al Deen). Recommendation: UNRWA should terminate all of the staff associated with the “UNRWA Staff in Syria” account, for incitement to hatred and breach of neutrality. #UNWatch makes fool of itself accusing shutdown @UNRWA school of anti-semitism. Credibility dead in water. Will anyone believe them again? Following is a letter to UN Secretary-General Ban Ki-moon, with a copy to U.S. Ambassador Samantha Power and the ADL, sent today by the Geneva-based non-governmental organization UN Watch. UN Watch is gravely concerned that the UN’s special relief agency for Palestinians, which received some $400 million from the U.S. last year in exchange for its signed promise to refrain from supporting terrorism and to uphold neutrality, is nevertheless disseminating crude, anti-Semitic caricatures on the Internet that incite to the murder of Jews. We respectfully demand that you take action immediately to remove the images, apply accountability to the highest levels of UNRWA, and apologize. We call your attention to two of the ten first items appearing on the UNRWA Facebook page of the Rameh school, based in the Jaramaneh camp outside Damascus, which are cartoons celebrating Palestinian car attacks against Israeli Jewish civilians. A senior employee of Amnesty International has undeclared private links to men alleged to be key players in a secretive network of global Islamists, The Times can reveal. The charity was unaware that the husband of its director of faith and human rights featured in documents released after a criminal trial at which connections were revealed between British supporters of the Muslim Brotherhood and Arab Islamists accused of plotting to overthrow a Gulf state. Yasmin Hussein was also linked to a Yorkshire-based aid agency that was banned by Israel for its alleged funding of Hamas terrorism; and criticised by colleagues for holding a private meeting with a Muslim Brotherhood government official during an Amnesty mission to Egypt, and staying overnight at his family’s home. Following is the currently updated chart, compiled by UN Watch based on United Nations data, of all UN Human Rights Council resolutions that condemn specific countries, from its creation in 2006 until today. Our analysis does not count the majority of resolutions that praise countries or merely address “technical” issues. In total, there were 62 condemnations of Israel, and 55 on the rest of the world combined. With its standing agenda item on Israel, one-sided reports, biased mandates, the UN Human Rights Council in its 10 years of operation has condemned Israel more times that the rest of the world combined. Thus, while the 47-nation body convened an emergency session into Israel’s response to Hamas rockets last summer, condemned Israel for alleged war crimes in at least two separate resolutions while giving Hamas a free pass, and created a massive commission of inquiry headed by a paid PLO legal adviser, it has done absolutely nothing in response to the Saudi bombardment of Yemen and killing of civilians. However, the latest statement on Yemen by the Office of the High Commissioner for Human Rights (OHCHR), which as part of the Secretariat is supposed to be non-political and respect the “highest standards of integrity” (UN Charter, Art. 101), illustrates that the UN’s civil service fails its professional obligations, and follows the line of the politicized Council. If anything, the moral and legal case for Saudi Arabia’s intervention in Yemen is far weaker than Israel’s case for responding to Hamas in Gaza. Published on July 22, 2015 in Iran and Saudi Arabia by unwatch. Closed Tags: OHCHR, Yemen. Congratulations to the UN human rights office for the long statement below on the suffering in Yemen that makes only one fleeting mention of the Saudi role, and no mention at all of the Iranian role. Once again, the world’s worst abusers of human rights are given a free pass. GENEVA, July 20, 2015 – A majority of countries and nearly all of the democracies on the 54-nation ECOSOC refused to support the NGO application of the “Palestinian Return Center” amid evidence of the group’s entanglement with the Hamas terrorist organization, yet a plurality of only 16 countries, including dictatorships like China, Sudan and Zimbabwe, managed to successfully propel the PRC’s application forward. Leading democracies were among the 13 who voted to reject the PRC’s bid, including the United States, France, Germany, the United Kingdom, Australia, Italy, Greece, Austria, and Finland. Others opposing the alleged Hamas front group included Albania, Botswana, Croatia, and Estonia. Another 18 countries abstained. UN Watch revealed today that the Palestinian Return Centre (PRC), a Hamas-linked group vying to win UN status today, celebrated the Hamas kidnapping of three Israeli teens, cheered Hamas rocket attacks on Israeli civilians, and threatened “punishment” for PLO President and Hamas rival Mahmoud Abbas. Above: On July 14, 2014, two days after the Hamas kidnapping of three Israeli teens, PRC posted this symbol of three fingers to cheer the abduction of the boys who were later discovered to have been murdered. A group that celebrates kidnappings violates the peace and human rights principles of the UN Charter and should not be granted NGO status.